Looking for photos from the Junior League’s Bachelor Auction photo booth? They’re all online (and hilarious, I might add) in this gallery! Enjoy! We know you like beer. We know you like helping people. So you’ll LOVE Hopebrew, a beer-drinker’s fundraiser for Get Hitched, Give Hope THIS Saturday, April 14, at Redhook Brewery in Redmond. Filthy Beer will be providing finely crafted home brews, Seattle’s BEST DJ Austin Beaver will be spinning, there will be eats & treats provided by Redhook, Dolce Lou, Cupcake Luv, and Yeah! Cookie. Get Hitched, Give Hope is hosting this amazing night of brews, music, and prizes to help meet our 2012 goal of raising $100,000 to grant wishes for people affected by life-threatening illnesses. All proceeds go to The Dream Foundation and Young Survival Coalition. On top of the music, brew, and bites – Hopebrew will also feature rad raffle items you can win from Bourgeoise Brunches, Road Dogs Seattle Brewery Tour, Red Hook, Jazz Alley, Red Chair Salon, and Woodinville Whiskey, among others! Because a party isn’t a party without a photobooth, the talented Laura Marchbanks Photography will be there rockin’ the camera – so be ready for a great time! WHO: You and all your friends. PLEASE use the buttons below this post to tweet/facebook/reddit this! 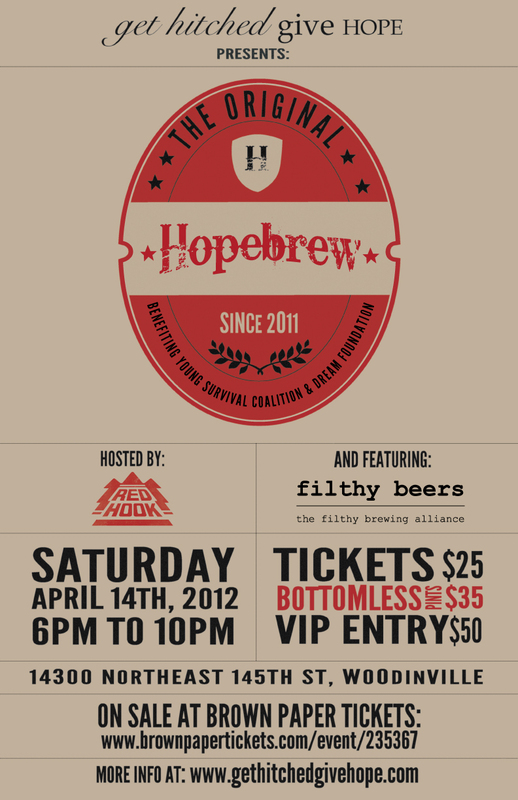 WHAT: Hopebrew:: a fundraiser for Get Hitched, Give Hope! WHY: Drinking beer and helping grant wishes, duh! By now we all know the extent of the devastation last Friday’s 9.0 earthquake and the ensuing tsunamis brought to Japan’s eastern seaboard. I am ever-thankful that my host family and friends in Tokyo, and those I know throughout Japan are all alive and well, as are their friends and family. I’m still worried about the loved ones of a few state-side friends, and until I hear from them, I’ll keep praying their families are safe. I’m tied in knots by the fact that I can’t be in Japan to help, and completely frustrated that I would only complicate things by trying to join a rescue/rebuild operation at this point. So Justin and I have done the only (and most effective) thing we can do in this situation: DONATE. We chose to give money to ShelterBox, an international disaster relief charity that delivers emergency shelter, warmth and dignity to people affected by disaster worldwide. ShelterBox was one of THE first organizations asked by Japan to help and were on hand on the Saturday after the quake. Each large, green ShelterBox is tailored to a disaster but typically contains a disaster relief tent for ten people, blankets, water storage and purification equipment, cooking utensils, a stove, a basic tool kit, a children’s activity pack and other vital items. I recently read about For Japan With Love, an informal group of bloggers rallying to raise funds to help ShelterBox aid more Japanese families. Please consider joining me this Friday for a Blogger’s Day of Silence and taking the time you would use to blog to go to the ShelterBox website and donate. The weather is bitter cold in Japan this time of year, and emergency shelter is essential for those displaced by the tsunamis. Each ShelterBox is $1,000, so by donating even a small amount, you are helping a group of ten or more Japanese people to find shelter and safety. If you feel more comfortable donating to the Red Cross, you can make sure your donation to them is used for disaster relief in Japan by donating directly to the Japanese Red Cross. If you really have no money to spare, make an appointment to donate blood locally, and/or sign up for the National Marrow Donor Program. They’re both free, and save lives every day. Thank you to the folks behind For Japan With Love for organizing this little rally. Please, please, do whatever you can to help. My heart goes out to everyone in Japan affected by this tragedy. May peace always be with you. What is Get Hitched, Give Hope, exactly? Well, it’s kind of like a cocktail party crossed with a boutique wedding show. Over 100 of Seattle’s top wedding vendors have donated their goods and services (not to mention their time!) to help raise money for a good cause by passing on amazing deals to local brides and grooms. The evening features food, music, dancing, a mini-fashion show, raffles, and of course, fabulous silent and live auctions for all things wedding related. It’s a great opportunity to snap up those wedding luxuries and necessities at great prices– often up to 50% off retail– all while giving back to others. All proceeds from Get Hitched, Give Hope are donated to the Making Memories Foundation to provide Stage IV breast cancer patients and their families with the funds for a final, memory-making experience together. It can take up to $4k to grant the wish of one family, and our goal with Get Hitched, Give Hope is to raise $50,000 for Making Memories this year. October is Breast Cancer Awareness month, so it’s especially important to remember that breast cancer can strike anywhere and anyone (men included!). One in eight people will be diagnosed with breast cancer in their lifetime, and for some, help won’t come in time. So dust off your dancing shoes and cocktail attire and join us to help make a difference! There’s definitely something for everyone at this year’s event: The silent auction will showcase everything from jewelry to stationery to photography. For brides, the silent auction tables also provide a great chance to meet with some of Seattle’s finest vendors and ask plenty of questions. On the main floor, there will be lovely models showing off gorgeous dresses, flowers, rings, and more. Attendees will have the chance to sample cupcakes, cocktails, and other libations in the lap of luxury. The evening will conclude with a show-stopping live auction that features fabulous items & packages anyone would love to win: A Tiffany’s Necklace; a Guy’s Night Out with limo, beer, and sports bar lounge; a Get Fit package with personal training, yoga, and trapeze lessons; and a his & hers Pamper package with services at the Four Seasons, to name just a few! Tickets are on sale online through Wednesday night and may be purchased at the door starting at 6pm on Thursday evening. Please stop by to say hello if you come!! I’ll be making the rounds with press, but you should be able to spot me: I’m the tall one with short hair. Justin will be there, too!